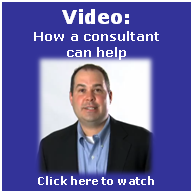 Here are seven reasons a consultant can help. Having the unique ability to work with multiple businesses, a consultant can be on the forefront of industry trends and success stories. Sometimes all it takes is a sounding board for a good idea to get traction needed to move forward. Sometimes a firm can get complacent and may need assistance breaking down barriers, related to resistance to change, to enable positive results. Many times a business can get the ball rolling, but needs another hand when it snow balls into something bigger. Being at the top of the ladder can be a lonely place for management, but that’s not the case when a consultant is used on a routine basis. When management and key stakeholders don’t see eye to eye, a neutral third party can evaluate the situation and help the two sides come together to best serve the firm. Often additional leadership is needed to take a fresh look at a business to see the best path to choose and then help motivate team to implement change.